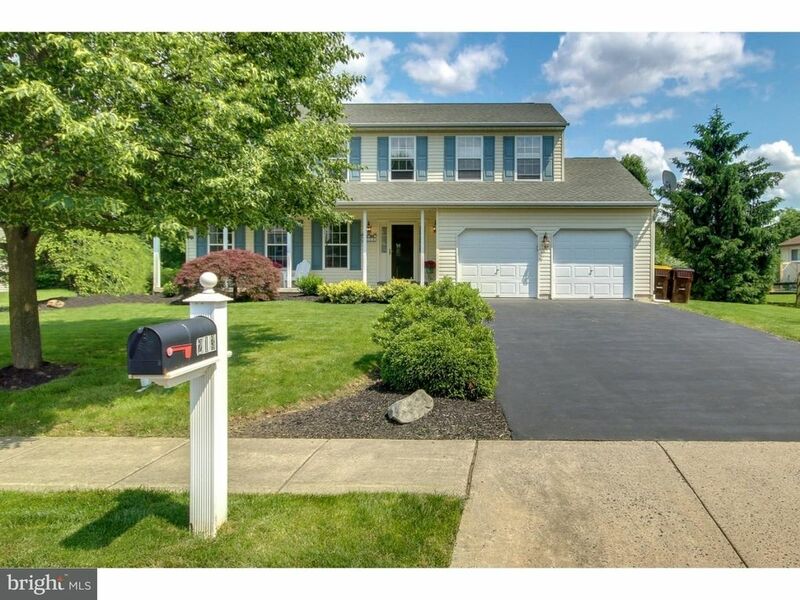 Beautiful 4 bedroom 2.5 bath, 2 Story colonial with covered front porch in HammerSmith. Formal entry with hardwood floors opens to Large Living Room which leads into Spacious Formal Dining Room. Kitchen offers beautiful solid oak cabinetry with upgraded stainless steel appliances, granite counter tops, SS under mount sink, SS Gas Range and overhead microwave and ceramic tile flooring. Eating area off kitchen with slider to expansive stained pressure treated deck open to deep back yard. Kitchen opens to Family Room w/ gas fireplace with wood mantle and marble surround. Beautiful Hardwood floors in Family Room plus ceiling fan. 2nd Floor offers large Master Bedroom w/ ceiling fan, crown molding and large walk-in closet. Master bath with platform tub and separate shower with custom ceramic tile. Three additional roomy bedrooms with wall to wall carpeting in two bedrooms and durable laminate in 4th bedroom. Full basement, 2 car garage and beautiful, deep back yard.